We researched 20 home elevator companies based on pricing, types and expert ratings. Check out our picks for the best home elevator companies. Inclinator is the first home elevator company to bring customizable elevators into the home. Their Elevette elevator is a cable drum drive system and comes in five cab styles. Easy climber home elevators are battery powered. It uses battery power to bring the cab up and it automatically charges the battery as the cab descends. Installation of an Easy Climber elevator takes about 16 hours – much less than the standard home elevator install. Pneumatic makes three models of air-driven home elevators. The cylindrical shape of the cabs takes up less room – 30 to 52 inches in diameter, depending on the model. The vacuum elevators use air pressure to raise and lower the cab, using no electricity during the descent and about 4.7 kilowatts during the ascent. Savaria makes and sells five models of home elevators that include hydraulic, gearless and winding drum elevators. Savaria home elevators feature 360-degree views, multiple cab sizes and styles and gearless traction technology for quiet rides. We evaluated 20 home elevator companies and chose the four best options after thoroughly researching each one. We carefully weighed pricing, home elevator types, customer support, ratings from experts as well as reviews from current home elevator users in our evaluations. The four best home elevator companies are Pneumatic Vacuum Elevators LLC, Easy Climber Elevator, Inclinator Company of America and Savaria. In this guide, you’ll learn about home elevator features and benefits, tips for choosing the best home elevator for your mobility needs and you’ll see individual evaluations of the top companies. You’ll also find helpful frequently asked questions about home elevators in this guide. Base your budget on your mobility needs, existing space and construction costs. Be sure authorized service is available in your area for regular maintenance. “Test drive” different types of home elevators before choosing one. Those who live in multi-story homes as they age are frequently concerned about navigating the stairs safely. It may be especially difficult for those that use an electric wheelchair or mobility scooter to get around. While relocating second-floor rooms like the bedroom and primary bathroom to ground level is an alternative to using stairs, this can leave you with less living space. You could sell the family home and buy a one-story house with laundry facilities on the first floor, but this comes with a steep price when you factor in closing costs, the expense of hiring a moving company and dealing with the emotions of leaving the memories made in your home behind. Installing a home elevator is the best solution for more and more seniors. What used to be only for the wealthy elite is now attainable for many more people, and the styles and models available in the market today make a home elevator a viable option that is growing in popularity. According to the U.S. Census Bureau, 49.2 million adults age 65 and older live in the United States. If you are one of these people, you could also be one of the nearly 10.5 million who report having difficulty walking or climbing. Many of these seniors find that they need to make adjustments to their homes to remain independent, causing home elevators to gain in popularity. There is plenty to choose from when searching for the perfect home elevator. The drive system, or how the elevator cabin raises and lowers, defines the types of home elevators available today. Cable-driven elevators are usually the least expensive while pneumatic elevators generally are the most costly. Chain-driven, traction units and hydraulic elevators fall into the midrange cost. Regardless of the drive system, there is a wide variety of home elevator styles available in varying sizes. From compact elevators designed to fit in spaces as small as a closet to larger models that can accommodate a wheelchair, home elevators can now be discreet part of your home, or they can be a focal point that enhances your décor. Cable-driven elevator systems are composed of a shaft, car, control system, and counterweights. Some models also require a mechanical room. Cable-driven elevators resemble those found in commercial buildings. These elevators take up the most space due to the shaft and mechanical room, so installing a cable driven system with new construction is much easier than trying to retrofit an existing home. Chain-driven elevators are similar to cable driven elevators, but they use a chain wound around a drum instead of a cable to raise and lower the cabin. Chains are more durable than cables and don’t need replacing as often. Chain driven units also don’t require a separate machine room, saving space. Traction or MRL (machine room-less) elevators work by sliding up and down a track with a counterweight. This type is an excellent choice for existing properties as they don’t require machine rooms or pits extending into the ground. However, traction units still need additional space over the top of the elevator to house components necessary to raise and lower the car. Hydraulic elevators are powered by a piston that travels inside a cylinder. With a power system entirely housed inside of the elevator shaft, there is no need for a machine room, and the controller is small enough to fit in a cabinet on a wall near the elevator. Holed hydraulic systems require the cylinder to extend into the ground to the depth equal to the feet the elevator will rise while holeless hydraulic systems need no pit. Pneumatic elevators utilize a vacuum system within a tube to power their movement. No pit or machine room is needed, making pneumatic home elevators the simplest to retrofit into an existing home. Unlike many other home improvements, adding a home elevator to your existing space comes with construction costs. Home elevators installed on an interior wall can require relocating wiring, air conditioning ductwork or plumbing. An alternative is to have the shaft built on an exterior wall to reduce labor hours. Installation costs: The average cost of a home elevator install is around $19,000 to $20,000. 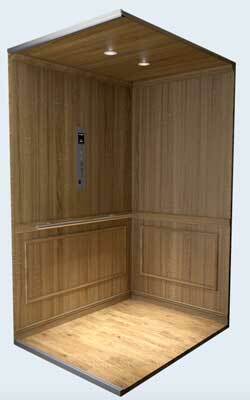 Hydraulic elevators: Hydraulic elevators cost around $30,000 to $40,000. Pneumatic elevators: Pneumatic elevators are easier to install which keeps installation costs down. They cost around $40,000 on average for the elevator itself. Cable-driven elevators: Cable driven elevators are less expensive than hydraulic, averaging around $20,000. Chain-driven elevators: When built into a new construction home, chain driven elevators cost around $25,000. MRL elevators: MLR elevators cost around $10,000 to $18,000 on average. 2. We evaluated home elevator companies based on our expert-guided buying criteria: pricing, customer support, ratings from experts as well as reviews. With so many types and styles of home elevators out there with different installation costs, technology and price points, knowing where to start your search may seem like a big task. Luckily, we did the hard work for you. Our in-depth analysis of home elevator companies focuses on what is important to the average person. We researched the top 20 companies that manufacture home elevators. Then we narrowed the list to our top three based on specific criteria we set by extensive research of government and consumer information. The result was a list of the three best home elevator companies. After our evaluation, we chose the best home elevator companies. Each of these companies stood out above and beyond the competition. Inclinator’s options for customizing are extensive, and the website makes it easy to combine the features and components you want for the perfect home elevator. Easy Climber home elevators don’t require a pit, shaft, machine room or dedicated power line, so the construction costs are affordable for nearly every budget. Savaria makes and sells five models of home elevators that include hydraulic, gearless and winding drum elevators. Powered by air, Pneumatic Vacuum home elevators are best for the environment and have the power to rise 50 feet with up to five stops. In 1923 self-taught mechanical engineer C.C. Crispen wanted to help a neighbor confined to an upstairs bedroom. Crispen invented the Inclinator, a patented electric-powered folding wooden chair with a footrest that moved on rollers up and down a steel rail fastened to stairs. Five years later, Crispen designed the first home elevator for winding staircases, the Elevette. Today the family-owned Inclinator Company of America continues selling the Elevette with the mission of allowing those with mobility issues access to every floor in their homes. Select the cabin style: There are five standard cabin styles to choose from, or you can opt to custom design a cabin. Select the type of finish for the walls, flooring, ceiling, handrails, lights and cabin operating panels. Select a drive system: The Elevette comes in three drive styles: cable drum, hydraulic and MRL overhead cable drum. Select Gates and Doors: Your elevator cabin can have gate openings on one or two sides, and you can choose from 18 different cabin configurations. Inclinator offers a large variety of collapsible and accordion gate styles in multiple colors and materials. Inclinator holds an “A+” rating with the Better Business Bureau. Easy Climber Elevator is sold exclusively by Aging in the Home Remodelers, Inc., one of the largest home improvement companies in the U.S. and a wholly owned subsidiary of firstSTREET, which markets products for “Boomers and Beyond.” For over 25 years, this group has been providing solutions to the challenges that seniors face as they strive to remain independent and comfortable in their own homes. 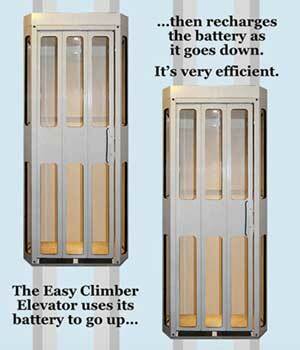 Easy Climber elevators are battery powered. As you go up the elevator uses battery power and as the elevator comes down, it charges the battery to full capacity. Installing Easy Climber Elevators takes about 16 hours altogether so you can have a home elevator in days rather than the typical weeks or longer. Fewer labor hours reduces the cost to the customer as well. The only home elevator of its kind, the Easy Climber doesn’t require a shaft because it installs on nearly any load bearing wall in your home. The system doesn’t need expensive rewiring or panel upgrades because it is entirely battery operated and recharges using a standard outlet. Select the location: Working with a technician, you select the best wall to install your home elevator. Easy Climber Elevator takes care of the paperwork for building permits and any requirements to determine if the installation is up to code. Preparation: Licensed carpenters from the company prepare the elevator location by cutting the hole in the ceiling and reinforcing the surrounding floor. Installation: The installation team installs the track, pulley system and home elevator in just a few hours. Easy Climber Elevator has relationships with several different lenders who specialize in home improvement financing, and they’re happy to help customers arrange financing. Easy Climber is not rated with the Better Business Bureau. Pneumatic Vacuum Elevators LLC are the designers and manufacturers of the only vacuum elevators in the world. 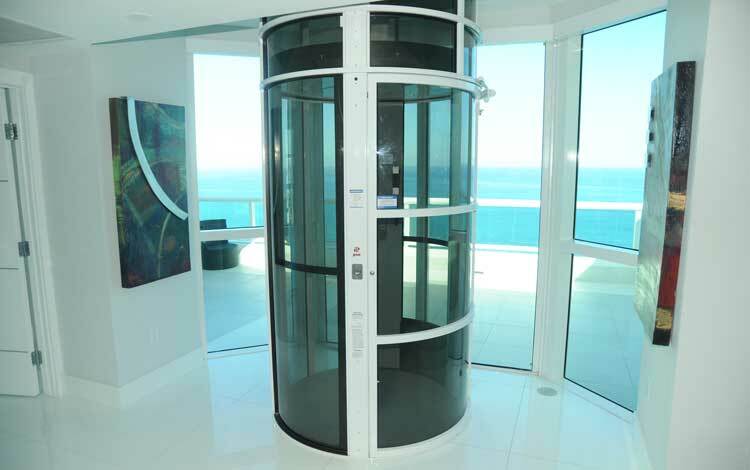 Since 2002, the Florida based company has been bringing eco-friendly elevators to homes on five continents. Pneumatic Vacuum Elevators use air pressure to move the cabin, so the elevator itself uses a minimal amount of electricity. With no chains or cables, there is no need for lubrication, and since air is the power source, there is no hydraulic fluid. With fewer moving parts, there is less maintenance with Pneumatic Vacuum Elevators. Rather than yearly service calls, you’ll only need to contact the company every four to five years (or 15,000 rides) for a replacement seal. 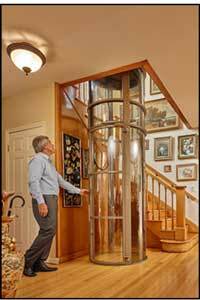 Another advantage to owning a Pneumatic Vacuum Elevator is that they are not built into the framework of your home, so you can take your elevator with you if you move. You can move the entirely self-contained unit to another location in your home if you decide to remodel or renovate. PVE30: One passenger home elevator with a 350-pound lift capacity. The PVE30 has the smallest footprint of any home elevator and an external cylinder diameter of only 30 inches. PVE37: Two passenger home elevator with a 450-pound lift capacity, offering an optional cabin seat. PVE52: Three passenger home elevator with a hefty 525-pound lift capacity and wheelchair accessibility. For financing, Pneumatic Vacuum Elevators partnered with LightStream, the nation’s premier online consumer lender and a division of SunTrust Bank, to offer low-interest loans with competitive fixed rates and no home equity requirements. Pneumatic is not rated with the Better Business Bureau. Savaria makes and sells five home elevator models ranging from elegant to basic. With the eye-catching design of the Vuelift, smooth ride of the Eclipse, the technology of the Gearless series, and space-saving and affordable Telecab home elevators, Savaria can work with your interior design to find the perfect blend of comfort and price for your needs. Savaria’s models include the Vuelift, Eclipse, Infinity, Gearless and Telecab. Depending on which model you buy, Savaira elevators have a weight limit between 500 and 1,000 pounds, have a maximum travel of 23 to 60 feet and travel at a speed of 20 to 40 feet per minute. 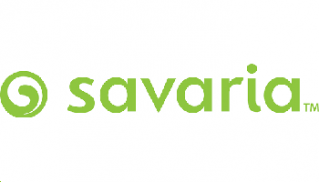 Read our comprehensive Savaria review. Readers of this home elevator guide also found these related articles helpful. Whether you’re planning a new build or you want to retrofit your current home to fit a home elevator, read about the installation requirements for home elevators here. While most home elevator maintenance should be done by a professional, it’s important to know what you need to have done to keep your home elevator running smoothly. There are so many variables involved in home elevator options and installation that giving even a ballpark estimate is impossible. Your best bet is to decide what size home elevator you need, how many floors it needs to travel between, then get estimates based on those factors from home elevator companies like those featured in this guide. Does Medicare help pay for the installation of a home elevator? Medicare considers elevators to be convenience items rather than medical necessities, even for those with a disability that makes it impossible to climb stairs. There are no Medicare benefits for home elevators, but for eligible veterans, VHA Directive 1173.14 stipulates that the Home Improvements and Structural Alterations (HISA) Program grants can help pay for the cost of installing an elevator in the home. Home elevators have very stringent safety standards from the American Society of Mechanical Engineers (ASME). Elevators for the home also must meet state and local code requirements and pass those inspections. How fast do home elevators move? The average speed for a home elevator is 40 feet per minute. What is the difference between residential and commercial elevators? Home elevators aren’t subject to the same size and weight requirements that commercial elevators are by the American National Standards Institute (ANSI). However, home elevators come equipped with many of the same safety features found in commercial elevators. Get multiple quotes and always be sure factory-trained technicians perform the installation. If mobility is an issue for you or a loved one and stairs at home are becoming a safety hazard, a home elevator is a viable option. There are more choices in styles, types, and financing today than there has ever been before to make finding a home elevator easier when you consider your needs, home design and your budget.